Melanie Bradshaw was determined to go to New York University, her dream school: so much so that when she was accepted, she ignored the more substantial aid packages at other schools to attend NYU, which offered her no aid. "For a while I was worried that I was making the wrong choice, because who can really afford this tuition? Obviously I went for it, despite the issue," she wrote in an e-mail. NYU costs a staggering $49,190 year when tuition, housing, books and other fees are totaled; Bradshaw, a sophomore, will have around $30,000 in debt come graduation. Her parents -- who took out $23,000 in loans per semester to pay the rest of her tuition -- will also be in debt. That's right: Bradshaw and her parents will shoulder a whopping $209,600 in debt by the middle of 2012. And she's not alone. In 2008, according to The Project on Student Debt, 72% of students from private non-profit universities graduated with an average debt of $27,650, an increase of 29% since 2004. That's $1,000-plus over the average yearly tuition at private institutions and almost four times the average cost of in-state public tuition. In other words: It will mean more than a decade of loan payments, interest charges and income drain for the average collegiate. And that's assuming the graduate lands a job in his or her chosen field. For those relegated to the ranks of barista gigs and dog-walking work in this Great Recession, the debt sentence will likely stretch even longer. Why do private colleges cost so much more than public colleges? More importantly, where does all that money go? "There is a culture in higher education that equates money and spending and growth in spending with a high quality product," says Jane Wellman, president of The Delta Project, whose 2009 report "Trends in College Spending" refers to institutional spending as the "black box" of education finance. The actual costs and spending at educational institutions is not that well understood, says Wellman. "The market's been telling [colleges that] people would rather pay more for what they believe is a higher quality product than to see costs cut at the risk of service." According to a 2008 Delta Project report on the growing imbalance in higher education finances, private institutions spend more than twice what public institutions spend for student services, such as admissions, career counseling, student clubs and financial aid administration. Where private institutions spend $6,655 per student for instruction, they spend almost double that on all the other services: $10,598 per student. Non-educational costs make up $1,208 per student, with private colleges spending more than $18,000 per student, twice what public colleges pay, and forcing more private college students to take out private loans. "A lot of students get set on their dream school and become very insistent. It's this school or nothing," says FinAid.org founder Mark Kantrowitz. However, "if you find yourself being forced to borrow from a private loan program, that's often a sign that you're over-borrowing and perhaps you'd be better off at a less expensive school." More colleges, according to "Trends in College Spending" are shifting costs away from education and related services, and more toward student services, which are then used to attract students willing to pay full tuition or the "sticker price." These students' tuitions allow schools to subsidize the costs of need-based students who could not afford it otherwise. That leaves students in the middle (as in middle class) to pay the newly-inflated full freight. "If [colleges] didn't raise their tuitions they wouldn't have to spend so much on student aid. They're sort of chasing their tail," says Wellman. A professor's average salary is $80,368 a year, while administrative salaries are higher -- NYU's president John Sexton made $1,265,110 in 2007 according to the American Association of University Professors -- but even cutting those salaries a la Mayor Bloomberg of New York, who's annual salary is one dollar, wouldn't put a dent in tuition, says Kantrowitz. Schools should focus on cutting energy costs by closing campuses over breaks or transitioning to a four-day class schedule, he says. A small percentage of students have found a solution, such as Jorge Alvarado. As a sophomore neuroscience major at Amherst College in Massachusetts, Alvarado attends one of the 71 schools in the country that is part of a no-loan commitment initiative, where colleges replace loans with grants in financial aid packages for low- income students. Students are still expected to pay an expected family contribution (EFC). Consequently, half of Amherst students graduate with an average debt of $12,603, according to College Board, far less than the national average, and paltry when considering that one year at Amherst costs $52,778. Having only to take out federally-subsidized Stafford loans to cover his EFC, Alvarado will have less than $10,000 in debt at graduation. "The financial aid package, to me, it was integral to picking what college I would go to ... if Amherst didn't offer me a package I probably wouldn't have come here," Alvarado said. "Those schools are sort of modeling a kind of transparency for consumers that it would be better if everybody had," says Lauren Asher, president of The College Institute for Access and Success. She says this initiative is the best way for private colleges to help low income students in not borrowing over their limit. Unfortunately, not all colleges have big endowments like Amherst's, which is valued at more than $1.3 billion, or about $770,000 per student. And even then, many colleges see endowments as an unstable revenue source. Until they do, students will just have to keep paying. "If you look at the cream of the crop, there is a financial benefit in attending those schools in terms of getting better paying jobs, but it doesn't necessarily compensate for the higher cost of those institutions," says Kantrowitz. For students like Bradshaw, it does; even if the Great Recession may dim her employment chances, it hasn't put a damper on her enthusiasm. The debt she accrues represents the future bet she's willing to make to attend the college of her choice. "I really feel like I spent more to get more," she said. "Hopefully I'll be qualified for a decent-paying job, so being in debt won't be the end of the world." Coming Thursday: Until the late 1980's, the average Pell Grant was enough to completely cover in-state tuition at many public universities. 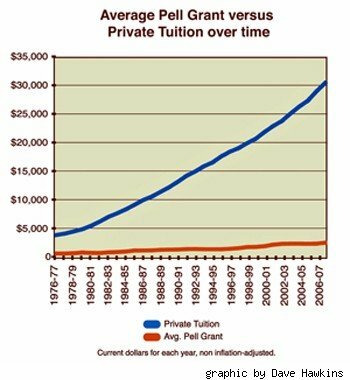 But in the last 15 years, Pell grants have barely increased as other scholarships and grants have become more elusive and competitive -- while covering a smaller share of tuition. Send us your tuition stories to MoneyCollege@WalletPop.com.